About the time Woody Guthrie would have been singing lullabies to his daughter Nora, a preteen Del McCoury was sitting in a pew at the Missionary Baptist Church listening to his mom and dad sing. That voice he got, that beautiful sweet Appalachian tenor 77 years in the making, is on full display on his new release Del and Woody (out April 15 on McCoury Music). Like McCoury, Nora Guthrie is still considering her mom and dad’s collaborative efforts as she tirelessly interprets and reinterprets the voice of her iconic father. Almost 25 years into a run of wide-ranging projects meant to keep her father’s memory alive, Guthrie’s inspired choices have instead kept his work absolutely vital in understanding America. With her direction, projects as expansive as Billy Bragg and Wilco’s Mermaid Avenue records as well as more specific projects like Jonatha Brooke’s meditation on Woody’s love songs or the Klezmatics’ take on his Hanukkah songs, have shown the giant canvas that Guthrie’s writing and life provides. Her newest project was to give Del McCoury a set of 26 unrecorded lyrics and allow him to choose, create, and record the music. The project, a couple of years in the making, was first written about here in Terry Roland’s excellent and thorough No Depression article in late 2014. Finally ready for release, what Del and Woody does better than any of the rest is display Woody Guthrie’s particular sense of the moment, his gift of telling the day-to-day stories that make up who we are, the simple stories that become our memories and myths. Del and Woody is the realization of two distinctly, genuinely American voices: Woody’s common-man vernacular and Del’s common-man sound. Perhaps the keenest observer of mid-century American life and particularly American dialogue, Woody Guthrie’s take on life is perfectly reflected in these little moments: a man taking his car to the garage to get fixed, a just-released prisoner working on a post-Depression work project, a young father marveling about the beauty of his toddler son. Nora Guthrie remembers that Woody from her childhood. “He had a sense of the now,” she says. “Other people would call that irresponsible. With Woody it was about what are we doing now? This now will lead to the next now. My mother was the one who was organized. She would leave a daily worksheet someplace where Woody could see it, and it would list everything for him to do: ‘8:00, wake the kids … you know 10:00, brush your teeth.’ He relied on that. She made sure he wrote Bound for Glory, and it wasn’t just him doing his daily scribblings. While previous Guthrie projects like the shattering first Mermaid Avenue record were perhaps more groundbreaking, more beautiful, more breathtaking, Del and Woody seems overall more real, more true to what Guthrie was and what McCoury is. What you get most is the joy of living, even in the toughest of times. Much has been written about the complexity of Woody Guthrie, but his genius — and it’s clear he knew this — is the simplicity of his voice. If Jefferson captured America’s promise, and Whitman captured America’s spirit, it was Guthrie who best captured her voice. And the common vernacular that was so important to Woody is clearly not lost on McCoury. That silly little voice McCoury does in the final chorus of “Aint a Gonna Do” tells you everything you need to know about his understanding of Guthrie’s humor, his humanity. It’s a little moment, but it’s a telling moment, absent from austerity. Real. 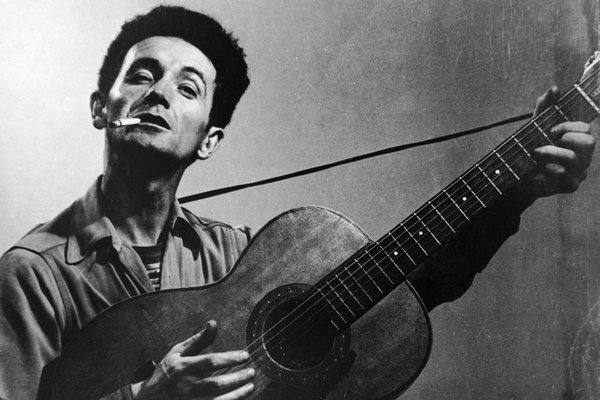 Although Woody Guthrie is perhaps best known as a political icon — the slogan “This machine kills fascists” written on his guitar, the devastation of songs like “Deportee,” the final verses of “This Land Is Your Land” — his gift in this set of songs is the subtle power of daily life. Most of those 3,000 songs Guthrie wrote during his life are simple songs of common men and women, going about their day. Making life — the unvarnished moments that become our story. With a lifetime on the road, and thousands of songs behind him, McCoury seems to have figured out that clear-eyed secret as well. McCoury laughs as he describes his kindred spirit: “You know, I’ve got to get this job done,” he says. “I don’t get too focused on any one song too much. I play on stage that way too. I work on one song and get it done and then go to the next one. I’m just that way. I like variety. I like this song for what it does that that song for what it is or says. There’s a sweet set of old-time numbers like “Family Reunion,” “Left in this World Alone,” and “Little Fellow,” interspersed with the bluegrass burners “Hoecake Fritters,” “Dirty Overhalls,” and “Aint a Gonna Do.” There’s some of Woody’s funny stuff too: “Wimmen’s Hats,” “Californy Gold.” What there isn’t is anything overtly political — interesting amid its release in this polarized season of discontent. Even two tunes that upon first glance seem likely to be Guthrie protest folk songs, turn out to be simple first-person stories. “Dirty Overhalls,” is a fascinating take. Upon first glance at the track listing, “Dirty Overhauls” [note the spelling difference] is one of the few recognizable Guthrie titles he recorded. But upon listening, you realize that this version is a completely different song. While Guthrie’s more mournful version features the refrain “Clothes don’t make no difference at all/We are workers and fighters all/My uniform’s my dirty overhauls,” McCoury turns this previously unrecorded version into a bluegrass duster, and features some blazing fiddle from Jason Carter and some great breaks from Del’s sons Ronnie and Rob. McCoury’s take is the story of a worker lamenting his smelly work overalls, which cause his girl to jump to the arms of a rich man. Again, the beauty and the power is in that simple first-person retelling. In “The Government Road,” you wait for the story of a just-released convict on a post-Depression era road project to take a turn toward political statement, because that’s what you think you know Guthrie to do. But the song never goes there. Instead, we just get his simple thoughts — let’s build this road, and when we’re done, we’ll build another one — and then it drives toward a joyous, sing-along chorus. It’s a lot like how we live: moment to moment, looking for that release of humanity. As is true of much of bluegrass music, the sound of Del and Woody is mostly about the joy of life. Those sing-along choruses, the excellence of McCoury’s band, especially his voice, are transporting. Since its definition at mid-century as Bill Monroe incorporated the sound of Earl Scruggs and Lester Flatt into his Blue Grass Boys, the pure release of bluegrass has swept generations of Americans up, led us to the dance floor, helped us let go — McCoury included. Listen to his beautiful wail on “Left in this World All Alone,” then go listen to something like 1968’s “Blue Yodel.” You’re hard pressed to say that voice has aged an iota. It’s remarkable and it’s precious, and you can still go out to an amphitheater or a festival this summer and hear it — the voice of America. It’s in this amazing band that Nora first heard the glimmer of what could be. “I wanted to officially recognize in this project that Woody was a writer for a band. I don’t think most people think of him that way, because of his association with Dylan and the folk movement, most think of him as isolated. But he wasn’t. He was ready to play anything, with anybody, anytime. Most of his recorded material was solo, often due to circumstance — many of his former band members weren’t around any longer after the Depression, having moved away during and after the war, or later because of McCarthyism.